Writely, an online web-based word processor application which recently acquired by Google in March 2006, is now been re-opened to the public Internet users to register and sign up for a new account without the need of invitation. Since Google bought the Writely web service last March, it was not accept new account registration to the Writely to migrate Writely service to Google servers. 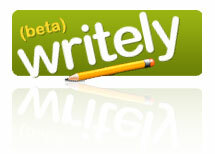 Writely will likely be integrated into Google’s suite of web applications. Writely offers document authoring and collaborative text editing capabilities with a WYSIWYG user interface within a web browser that utilizes advanced scripting and AJAX. Writely features access controls, ability for multiple people to work on a document in real time, secure storage that saves a document every 10 seconds, ability to save the files created in Microsoft Word (.doc), Postscript (.ps), Rich Text Format (.rtf), ODF (.odt), HTML (.html) and PDF (.pdf) format, no storage limit for files or documents, integration with blogging servers including Blogger. Beside, the easy-to-use interface has menus, keyboard shortcuts, and dialogue boxes show up in a way similar to a GUI-driven desktop word processor, such as Microsoft Word or OpenOffice.org. Write your word documents with Writely (acquired by Google, now Google Docs as part of Google Drive).